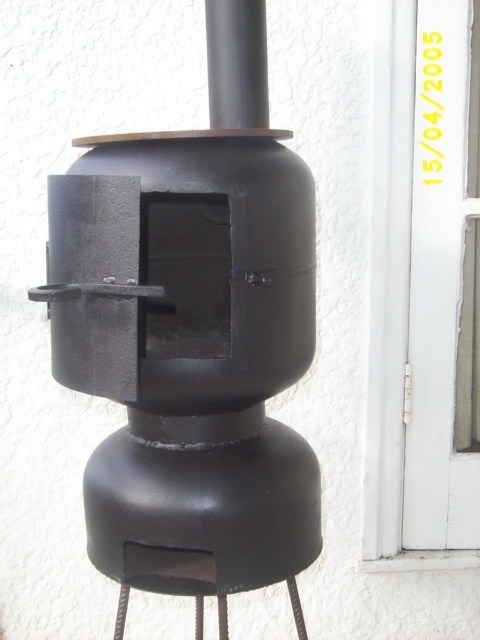 One of our most popular winter lines, is the Outdoor Pot belly Stove, made from recycled 9kg Gas Bottles. These are very open to creativity and can easily be customised to your requirements and only governed by price. We can, of course cater to almost any fabricated designing whim you wish to express. 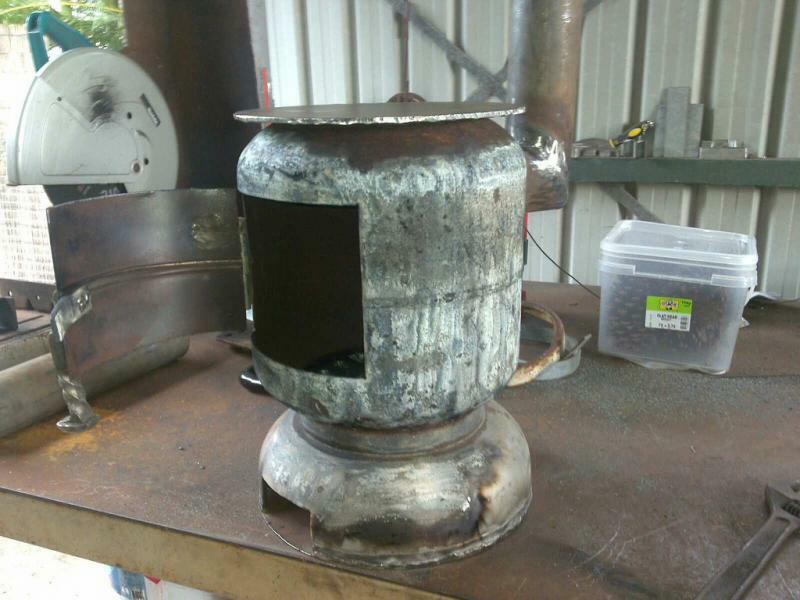 We can supply parts for some of the old Rayburn Stoves, and cast new refractory insulation. Stove repairs; a call out fee for the first hour depending on your location, then hourly on site rates apply. Cast Iron welding is done at our facility. 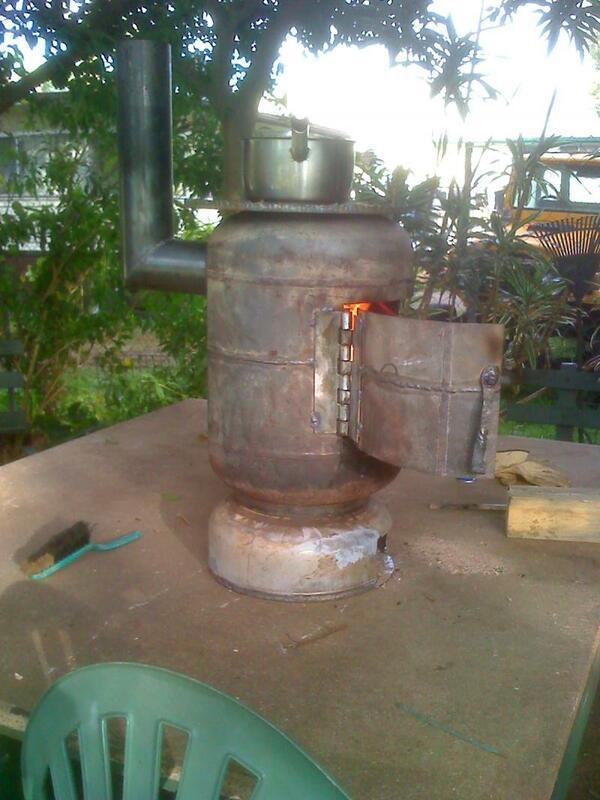 The PotBellies are usually made from 9kg Gas Bottles, however depending on availability, a larger model is available from cut down, large Vehicle Cylinders. 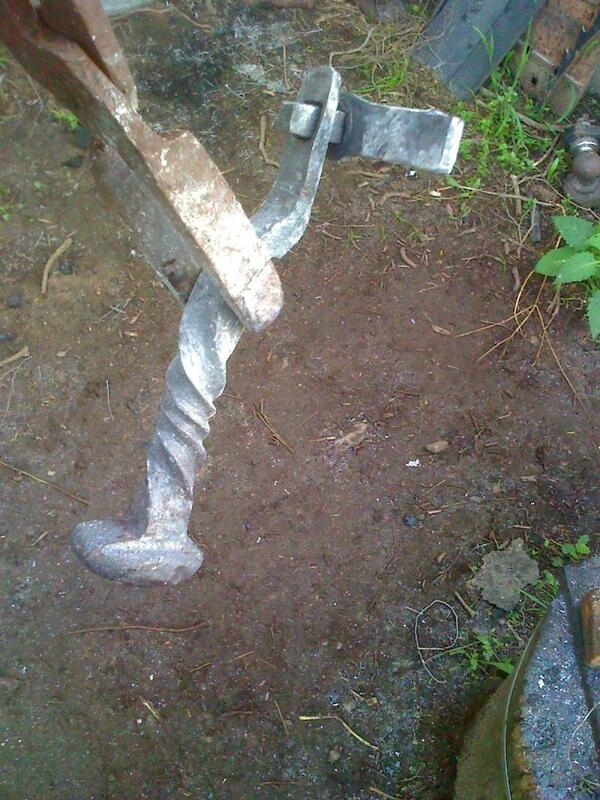 Most have hand forged latches and hinges. I started making these in 2000. 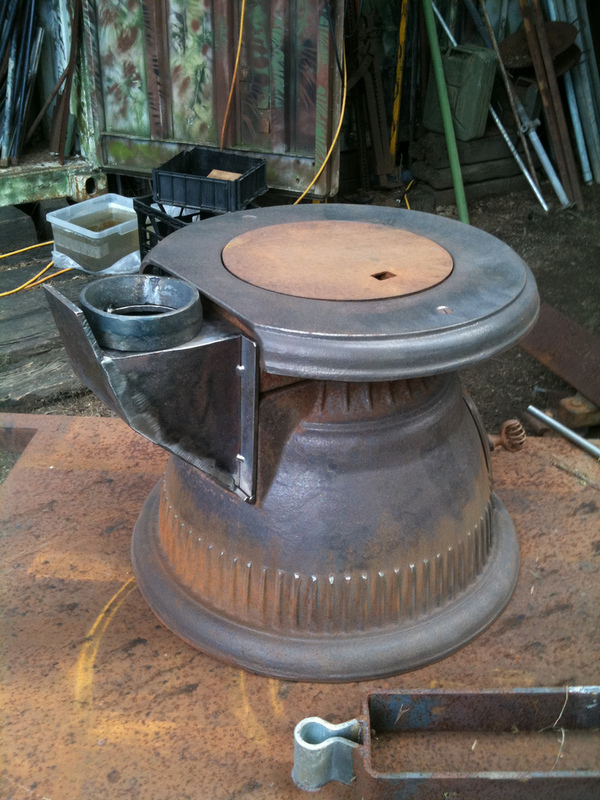 A basic 2 Ring, 4 Leg, welded steel reo stand raises the unit to a comfortable, usable height for cooking and warmth. A 6 to 8mm plate is included and may be removed for cooking with a Wok. These fabricated Outdoor Heaters, unlike Cast Iron units, are virtually unbreakable, much lighter, more durable, and will last a number of years left out in the weather. Pictured as a rough size comparison between the 9kg(standard), and the Larger Unit. Much larger Units can be customed as Spits with Gas Burners. P.O.A. All units can have swivel or swing out plates, grills, and camp oven attachments fitted, or customed as smokers, or as over the fire hot water donkeys, and internaly fired hot water systems. Additionally--The stands depending on request and your pricing limits can be decoratively forged steel to a basic concrete reo. The units themselves can have stainless inlays or externally welded forgings. This is one of our larger ones in its raw state (unpainted), in use, on our BBQ table. 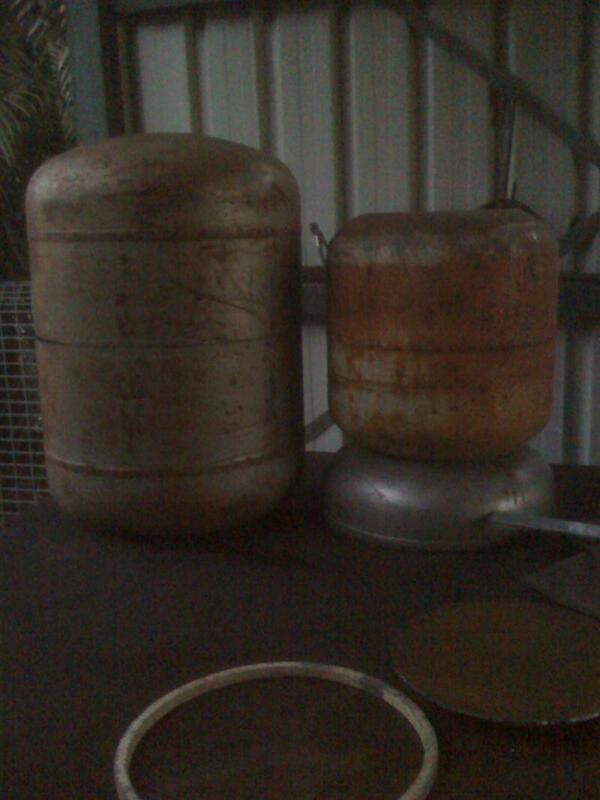 These units have a larger cook plate of 8 to 10mm and larger cooking area of course. These units start at $550.00. one of the latch's, Hand forged, Hot Twisted, and hand punched, from a rail nail. This assembly is welded through the door, to provide a robust, secure latch. This type of handle does get hot and pliers are the suggested utility for opening and closing. Wire wrap/coil handles will be cooler, however, due to proximity will still be too hot to touch without protection. 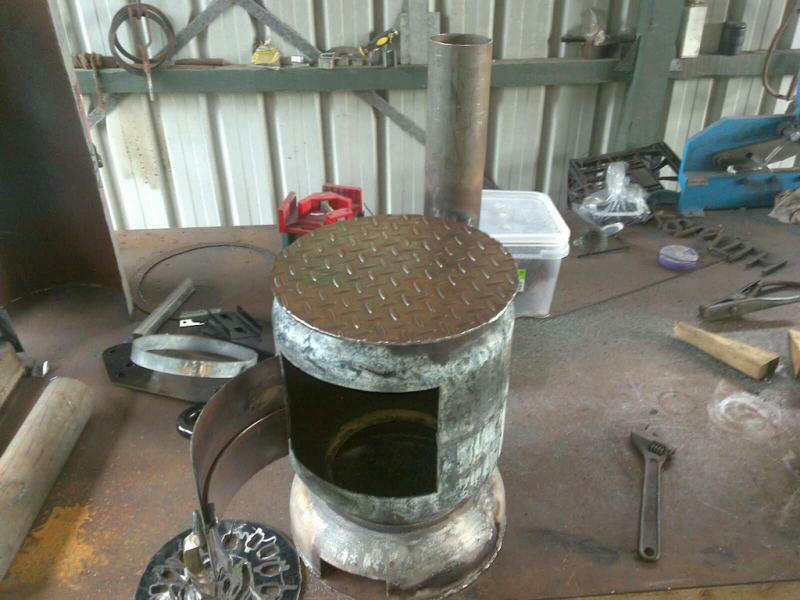 Copyright 2009-2015 brisbaneblacksmithsupplies. All rights reserved.